The Favorites is a series briefly exploring films I love, to find out what makes them - and me - tick. 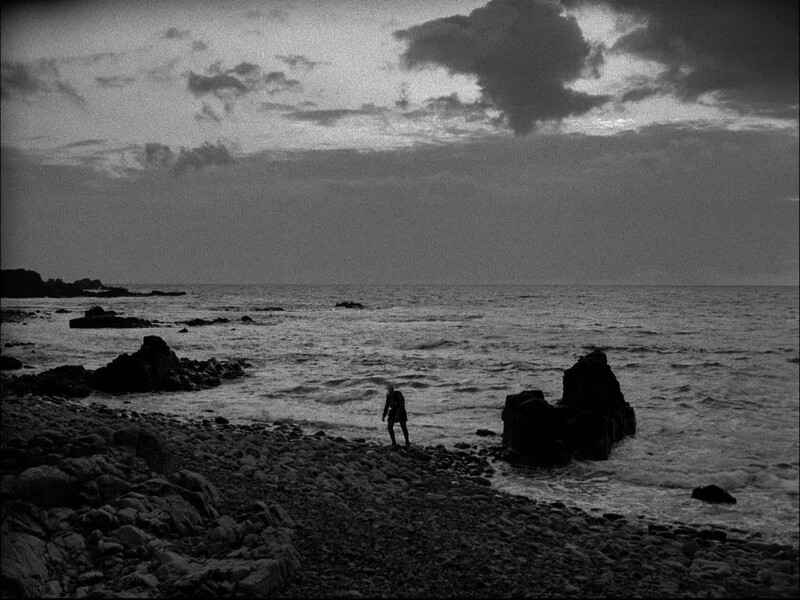 The Seventh Seal (1957/Sweden/dir. Ingmar Bergman) appeared at #70 on my original list. What it is • Like a greatest (or grisliest) hits album of medieval Europe, The Seventh Seal crosses dewy meadows, dirty village squares, isolated churches, overgrown woodlands, and dank castle walls to touch upon the Crusades, the bubonic plague, traveling minstrel shows, self-flagellating penitents, religious visions of the Virgin, witches burned at the stake and a personified figure of Death who seems to have stepped down off an allegorical church painting. At the same time, the film is very modern, gazing out at the postwar world with its existential crises of faith, Cold War tensions, and specter of atomic destruction, and recognizing a correspondence with the distress of the Middle Ages. Cutting a particularly contemporary figure is Jons (Gunnar Bjornstrand), squire to the pained Antonious Block (Max von Sydow, sixty years shy of Star Wars, yet already weathered and weary). Jons speaks with an atheistic frankness and worldly cynicism that at times makes him feel like the film's conscience. But Ingmar Bergman - crafting what may remain his most iconic feature after a lengthy, prolific career - is careful not to allow any character to simply become his mouthpiece. Not only is each intellectual, spiritual or (mostly) emotional perspective allowed expression and contradiction, there is also a sense of fluid uncertainty guiding the movie's course. Perhaps that's the most remarkable thing about this movie, that such a finely- and carefully-crafted piece of work can allow itself the freedom to test various points of view, to try on many different forms of human experience, high and low, pleasant and painful, and refuse to settle on one didactic argument about the vastness of life. Then again, perhaps the most remarkable thing about this movie is that it takes the vastness of life as its subject in the first place, and is able to do it justice by focusing on a small medieval microcosm. Sometimes an artificial distinction is created between predominantly visual films - be they blockbuster spectacles or experimental tone poems - that work on the senses and talky films that operate on the intellect. Many films perpetuate this stereotype by falling into one trap or the other. That's one reason I love Ingmar Bergman. God knows he isn't afraid to have his characters discuss their thoughts and feelings, ripping them apart, trying to piece them back together, in a fashion that the uncharitable (and maybe the characters themselves) would label neurotic and self-indulgent. But he also embeds these anxious discourses amidst images of great beauty, including long stretches of silence in which we observe faces and landscapes which speak with their own pre-verbal power. The Seventh Seal is not a particularly subtle film. It wears its concerns on its sleeve, daring to both verbalize and visualize grand ideas about faith, despair, and, well, Death. Could you possibly come up with a more obvious symbol than a Crusader playing chess with Death? But Bergman embraces the conceit unapologetically and with a fair amount of humor (this is actually a very funny film, at least if you can share Bergman's arch and often rather broad sense of comedy), and it works. I like The Seventh Seal because it seems to run the gamut of cinema. Black-cloaked Death is as iconic and fantastic a figure as a T-Rex or Terminator robot (the film has been parodied in pop culture from Sesame Street to Last Action Hero), while at the same time the film boldly embraces literature, religion, history, philosophy, and other arts as if wrestling with these concerns is the film's, and our, birthright. How you can see it • The Seventh Seal is streaming on Hulu and available on Criterion Collection blu-ray/DVD from Netflix. It is also available for digital rental or purchase from these sources. I wrote a full-length review of the film as part of my "Big Ones" series four years ago and included a clip at 5:00 in "An International Era", chapter 11 in my "32 Days of Movies" video-clip series. Images from the film were also frequently sampled in my Cinepoem video "Idylls of the King". What do you think? • Does Bergman have a particular point of view in The Seventh Seal, or is he just investigating different ideas without committing? If he does, what is it? Which points of view do you identify with as you watch the movie - the anxious Antonious', the cynical squire's, the joyful actors', the weary servant's? How does the film lead toward Bergman's later films? Perhaps more interestingly - given that this was already his seventeenth film - how does it build on what he had done before (one example I like: the long-forsaken wife whom Antonious returns to at the end of the film is played by the star of Bergman's first feature)? Does the film capture a real flavor of medieval life? What other films do an equally good job with this? Is the film too on-the-nose, too overtly symbolic for its own good? Do you feel Bergman's later films are more subtle, and do you prefer that subtlety?